Work-related stress can be caused by psychological hazards such as work design, organisation and management, and issues like bullying and violence. Download "Work-related stress can be caused by psychological hazards such as work design, organisation and management, and issues like bullying and violence." 3 individual factors - recognising that people are different and catering for those individual differences. Step 2 Identify the risks which flow from the hazards Who might be harmed? How? Step 3 Evaluate the risks, eliminate or manage them Which risks can be eliminated? How can other risks best be controlled? (refer also to the Risk Assessment matrix in the Federation's Risk Assessment and Management leaflet). Some factors to consider include: Culture Is there good open communication, support and mutual respect? Are the views and opinions of teachers valued? If not, communication should be improved. Demands Are teachers overloaded? Do they have the capabilities and capacities for their tasks? What about the physical (noise, ventilation, lighting, staffroom space, etc.) and psychological (violence, bullying etc.) environments? Sufficient resources should be made available if there are problems e.g. individual workloads reduced, tasks re-prioritised. Proper training should be provided to teachers who need it to perform particular tasks competently.. Effective policies should exist and be implemented to deal with issues such as disruptive student behaviour and violence Control Do individuals have sufficient say in the way their work is carried out? 5 Given the potential significance of work-related stress, it is advisable to document the findings of any risk assessment and management plan. This makes it easier to share the information and will assist with implementation, monitoring and review. Step 4 Review the assessment at appropriate intervals. The OHS Regulation 2000 "requires employers to review a risk assessment and any control measures flowing from it whenever it becomes apparent: a. the risk assessment are no longer valid, b. an injury or illness related to the hazard has occurred, or c. a significant change is proposed in the workplace, or in work practices or procedures related to the hazard." What if the hazards giving rise to work-related stress are not dealt with adequately at the workplace? 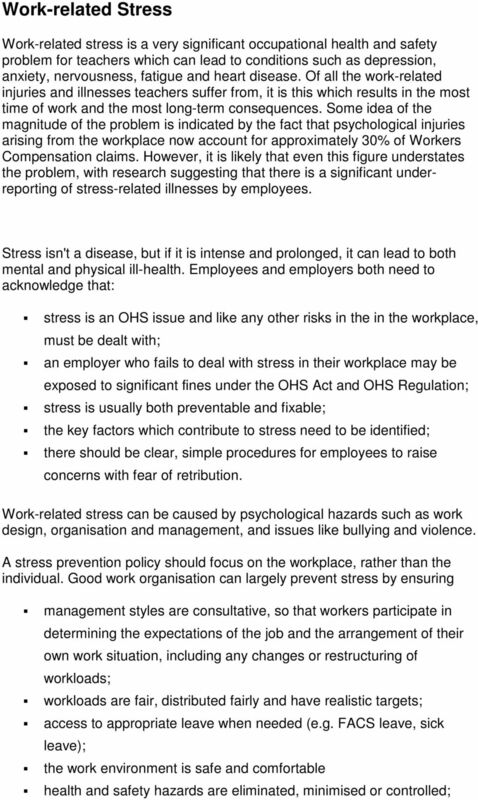 Members should ensure that hazards which give rise to stress are reported to their principal or manager, and to their OHS Representatives/OHS Committee. Like any other OHS problem, if the employer does not deal adequately with it in the workplace, a WorkCover inspector can be called in to assess the matter. This may result in improvements notices being served on the employer issued and/or fines being imposed. Other useful resources: Your Teachers Federation organiser Federation leaflets: Occupational Health and Safety Risk Management and Assessment Authorised by John Irving, General Secretary, NSW Teachers Federation, Mary Street, Surry Hills 2010. The policy also aims to make clear the actions required when faced with evidence of work related stress. 6 Work Experience Schemes: advice for educators on health and safety Summary Many young people benefit from taking part in work experience placements. But work can be hazardous, especially for young people. This information is for members of the NSW Teachers Federation who are employed in schools, colleges, AMES centres and related workplaces. D 1. Working with people Develop productive working relationships with colleagues. Unit Summary. effective performance. DEMANDS: ARE YOU DOING ENOUGH? How much work is there? DEMANDS: ARE YOU DOING ENOUGH? How much work is there? Ensure there are sufficient resources to do the work allocated: o If there are insufficient resources seek guidance from management about priorities. Department of Justice and Attorney-General www.worksafe.qld.gov.au Overview of work-related stress 01 Stress is a term that is widely used in everyday life and most people have some idea of its meaning. VIEU PREVENTING WORKPLACE BULLYING INCIDENT REPORT FORM. Workplace health and safety committees are also known as occupational health and safety (OHS) committees.